The fission rate and, therefore, the power level in a reactor, is controlled by rods that can be moved in or out of the reactor core. These control rods contain an element having at least one stable isotope that is a "neutron poison'' (i.e., an isotope with a high absorption cross section for thermal neutrons). Examples are cadmium (113Cd) and boron (10B) as boron carbide. When the rods are fully inserted, the reactor is shut down. The reactor can be shut down by an operator or automatically by one of the engineered safety systems, if one of the various sensors in the core detects an unsafe condition (of neutron density, temperature, pressure, coolant flow, etc.). Each type of power reactor has several intrinsic safety features. When a reactor is operating at a steady power level (steady fission rate), the rate of production of fission neutrons is equal to the rate at which they are absorbed in the core plus the rate at which they escape from the core. Absorption can be by H2O,37 control rods, fuel-rod cladding, fission products in the fuel, structural materials in the core, 235U to cause fission or to form 236U, 238U to cause fission or to form 239U (which is the source of the 239Pu that accumulates in the fuel), and 239Pu to cause fission or to form 240Pu. 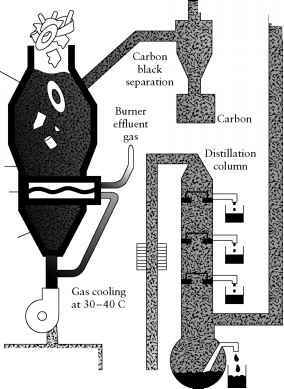 A safety-related question is, If the reactor is operating at full power and there is a temperature transient (e.g., a sudden increase in temperature of the water in an LWR, for example, because of a decrease in demand for steam or failure of a coolant pump and so on), how will the reactor respond? All the reactor parameters change with temperature. The cross sections for all the neutron reactions that can occur during the slowing-down process will change. Some will increase, others will decrease. Also, there will be density changes, especially for water. Analyzing this complex combination of changes shows that the overall temperature coefficient for changing the power level for LWRs is negative and the reactors are stable. Therefore, if there is an increase in sudden temperature, the fission rate will decrease until the temperature before the event is restored. A positive temperature coefficient would lead to a continuously increasing temperature and an unstable reactor. Another question is, How will the reactor respond if a void is formed in the water of an LWR? Because a void is the absence of the neutron moderator, the number of thermalized neutrons will be insufficient to maintain a constant rate of fission with themal neutrons. Thus, the void coefficient (again, for the power level in this discussion) is negative and the fission rate will decrease. 37A good neutron moderator is efficient in removing kinetic energy from a fast neutron in each elastic collision, and it has a low cross section for absorbing a thermalized neutron. The order for thermalizing is H > D > C, i.e., decreasing order with increasing mass. However, when absorption is taken into account, the ranking order of moderators is D2O > C > H2O. boiling water as the coolant and minor moderator. A large void—one beyond that allowed for in the design (i.e., boiling water under pressure)—creates a positive void coefficient because it represents a removal of H20 as an absorber of neutrons that have already been thermalized by graphite. This positive void coefficient is not overweighed by the negative coefficients for the other effects. Even though nuclear power plants have engineered safety features designed to prevent accidents by automatically and rapidly adding neutron poisons to shut down the reactor if a dangerous condition is detected, they are vulnerable to a type of accident that is not a problem for a power plant using a fossil fuel. After the reactor has been shut down, the core is still a large heat source (5-7% of full-power heat output).38 In fact, the decay heat generated in the fuel elements at the time of shutdown is more than sufficient to melt the reactor core if, after a normal or emergency shutdown, the heat is not removed by continued pumping of coolant through the core. To provide emergency cooling, the power plant contains an engineered safety feature called the emergency core cooling system (ECCS), which is turned on automatically to remove the decay heat if the normal cooling system fails. Such a failure is called a loss of coolant accident (L0CA). If power for the ECCS from outside the plant (from the power grid) fails, diesel-operated generators are supposed to turn on within a few seconds to supply emergency power. We have not discussed the rate at which the power level of a reactor can rise. Fortunately, the delayed fission neutrons slow the rate so that within defined limits of safe operation, the time available for adjusting the power level is reasonable. For details, see the additional reading and sources of information at the end of the chapter.